Work package 8 comprises the collection of all documentations for the approval process by the national authority of Switzerland for one clinical trial (phase Ib / IIa) (Fig. 1). 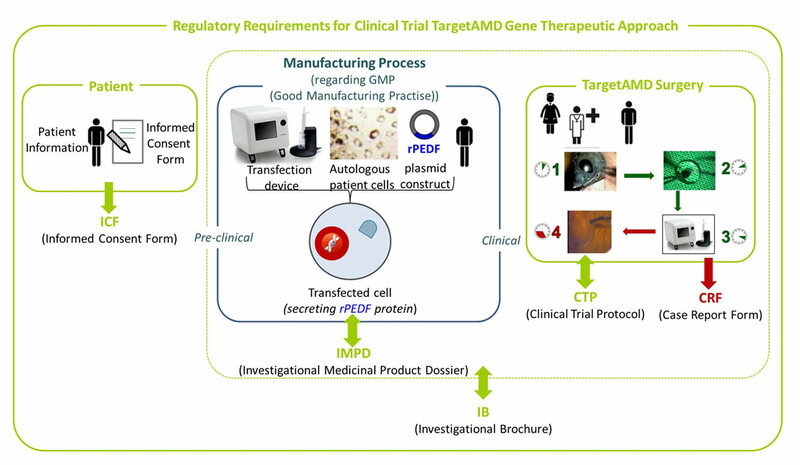 Regulatory authorities will assess the criteria of safety, tolerability and proof-of-principle for the prospective somatic gene therapy which will represent an alternative approach to treat patients suffering by the exudative form of Age-related Macular Degeneration (AMD), by transplanting autologous PEDF-transfected iris pigment epithelial cells (IPE) to the subretinal space of the patient’s eye. 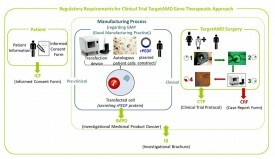 The approval must be given regarding the regulatory requirement of the manufactured Gene Therapeutic Medicinal Product (GTMP) and its dossier given by the Swissmedic (CH) as well as the local ethical committee, illuminating the trial design regarding the ICH (International Conference on Harmonisation) and safety criteria for the patients. Fig. 2: Flow chart of documentation requested by the regulatory authorities and ethical committee, to approve a clinical trial. Under the guidance of the Clinical Trial Centre of UNIGE (CRC, Centre de Recherche Clinique, UNIGE), the clinical trial protocol (CTP) will be finalised in cooperation with the experienced surgeons, Prof. Thumann (coordinator UNIGE), Dr. Stolba (partner KAR) and Prof. Garcia-Layana (partner UN). The protocol will be the ‘operating manual’ for the clinical trial (CT) and ensures that all patients are treated in the same way. 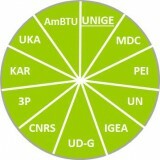 The protocol describes background and reasons for the trial, scientific rationale, objectives, design, methodology, statistical considerations and organisation of the planned CT. Additionally, approval relevant documentations are the preparation of an Investigational Medicinal Product Dossier (IMPD), which will be accomplished by partners UNIGE and AmBTU. The IMPD provides the information on the quality of the GTMP to be used in the clinical trial, and is a compilation of studies on the preparation, quality of the drug product, preclinical investigations to establish safety and effectiveness in animal models. The investigational brochure (IB) serves as guideline to manufacture the GTMP in a safe and standardised way (Fig. 2). Relating the patient’s elucidation of the surgery intervention, the patient information as well as the informed consent forms (ICF) will be generated, easily to understand for the patient, according to recommendations by the regulatory and ethical authorities. A risk management will be deployed to register any Adverse Events (AE), Serious Adverse Events (SAE) or Suspected Unexpected Serious Adverse Reactions (SUSAR). The Clinical Trial Center of the Hôpitaux Universitaires de Genève (HUG) will support the partner UNIGE in data management, monitoring and quality assurance. Getting the approval from the regulatory authority, milestone 4 is reached, by completing all requirements for the TargetAMD clinical trial in Switzerland.